This video talks about how shallow relationships can get while you are drinking alcohol and how they really improve once you stop. 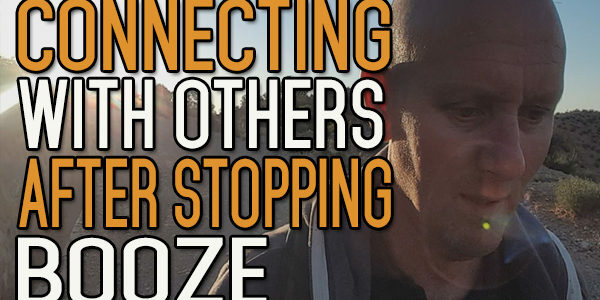 Today’s video is about making meaningful connections once you’ve stopped drinking alcohol. When I was drinking, one of the things I always thought about myself was that I had very deep and meaningful relationships with people, and my friendships had a lot of depth. But most of the time, they were very shallow and meaningless. The only meaning they had, the only connection I had with a lot of these people was the fact that we happened to drink in the same pub. We drank the same type of stuff. We all used alcohol as self-medication. We always used to sit there and talk about things passionately. You’re passionate about doing the things you’re doing, but there was no real passion there. There was no real connection. It was always just doing the same old thing on the hamster wheel of drinking, getting drunk, sobering up, feeling the consequences and so on. I went through that and my so called friends went through that as well. I’m not saying that every person that I’ve ever drank with were of the same calibre, but recently when I went back to Ireland, it was really highlighted to me how much of a difference was between me and the people I used to drink with. And it was sad from my perspective because I didn’t want that. I suppose I was looking for it a little bit, but these are my friends. One of my best friends at the time, we met up with his ex-girlfriend -they’d split up the year before and all because of the alcohol. And, when we were talking about this guy, I had every intention of meeting up with him, and when I met the girlfriend, I thought ‘I don’t really want to meet up with him’, and not just for my sake. Maybe it was selfish, but I feel like I’ve changed so much. I feel like my life has improved so much. I remember this guy,we used to talk all the time about how much we wanted to make changes, and how much we wanted to do things. I remember we sat in a bar one day, and one guy came in that I didn’t know. He was a friend of my friend. He said ‘yeah, I was over in Australia. I don’t drink much anymore. He takes time off work and he goes off for a month. And he had the money because he was not drinking. I remember him leaving and the two of us were sat at the bar and we went quiet for a while. We both thought it was a great idea, that we should do it. But we just carried on with our normal lives. Underneath it all, I was planning to move to Spain. I always felt a little bit that I let my mate down because I did do that. I felt really sad at that, but in that first year I was like ‘come on over and we can do this’. He never came over in the first year. We just kept in contact, but when I used to talk to him on the phone, we talked about alcohol. I was still asking him to come over, and he never came over. He went over coming to see me in Spain and not drinking and stuff, how boring for him. But I’m saying, when I look back on all those ears of drinking, it was very surface level stuff. It was always based around alcohol. So, relaxation was always based around alcohol. Celebration was always based around alcohol. There was a time for work and a time for alcohol. But in the back of your head, you couldn’t drink all the time you were off or you would be known as the alcoholic and you didn’t want that. You had to do other things as well. You couldn’t really and truly allow alcohol to take over. I think the more you drink, the more likely that that will happen to you. But, since I’ve stopped drinking, not only has my relationship with the people I know deepened and become much more meaningful, the whole thing, my whole life seems to be about growth now, rather than stagnation. That was all it was about before. It was about trying to maintain a hold on the status quo and keep some money coming in, so that we’d keep drinking. It was never about keeping the drinking alive. We didn’t have that in the front of our minds. But you’re all the time trying to keep the behaviour going, and that’s a part of the behaviour. And that’s what you work for. You’re always trying to keep the status quo going. I think that’s as best as you can manage when you drink a lot. I think now since I’ve stopped drinking, it’s all about trying to grow and trying to make things better. It’s only as good as it is, it’s not as good as it can be. That is where my mind is focused almost all the time now. How good can my life be? I got the hand that I was dealt, and that was it. My father was my father, my mother was my mother. Who I was as I grew up, that’s just the way it was. But, up until I stopped drinking, my whole thing was about just trying to be the person that I thought I should be. Now, it’s about trying to be the person that I think I can be. There’s a massive difference between those two things. I know this thing is about meaningful relationships, but that’s what this is all about. You can’t grow on your own. You have to have people with you. You have to have meaningful contact with other people. It’s like chalk and cheese, it’s two different things. I think heaven and hell is a better analogy. I will leave it there anyway. YOU DON’T HAVE TO SEE THE WHOLE SSTAIRCASE, JUST TAKE THE FIRST STEP.